Scientists have just released the first photos of the incredible 298 million year old buried forest that was recently found below a coal mine in Yuda, China. 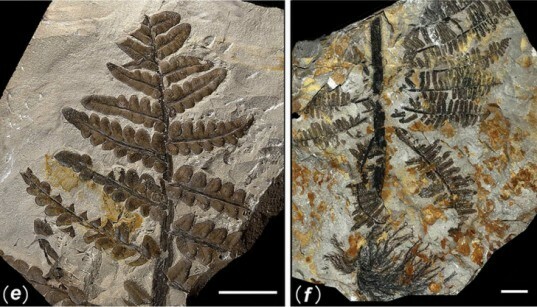 The extensive array of tree and plant fossils that were photographed were found still arranged in a forest landscape - a first for fossil discovery. The entire forest was covered by fallen ash, which erupted from an ancient volcano, preserving it for eternity. Had it not been for the volcanic eruption, the Permian Era forest and trees would’ve been transformed into coal over the millions of years that have passed since it thrived on the super continent of Pangea. 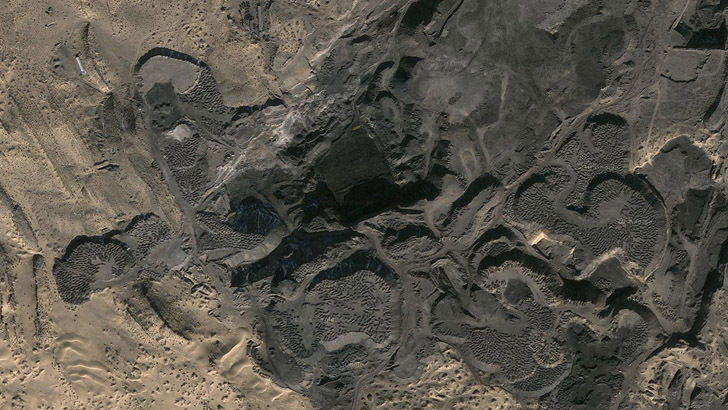 The vegetation and animal species that grew over the layer of volcanic ash have compressed to form the coal mine that lies above the discovered site. The fossil forest is located in Inner Mongolia, in the northern region of the Helanshan Mountains. The area preserved by the volcanic ash is suspected to be a staggering 6.2 miles in length – almost the full length of the coal mine, which is 7.72 square miles in area. Thus far, the scientists have explored only 10,763 square feet of the ashen fossil forest, uncovering a multitude of leaf, tree, and plant fossils, some of which still bearing a greenish hue. An array of ferns have been found in addition to extinct trees with leaves still attached to the stem, and branches leading down to their trunks. The volcanic fossils give an accurate indication of where each plant grew in relation to the others in the forest. Scientists, lead by University of Pennsylvania’s Hermann Pfefferkorn, will continue to explore this “Permian vegetational Pompeii,” documenting the nearly 300 million year time capsule as they go on. Had it not been for the volcanic eruption, the Permian Era forest and trees would’ve been transformed into coal over the millions of years that have passed since it thrived on the super continent of Pangea. The vegetation and animal species that grew over the layer of volcanic ash have compressed to form the coal mine that lies above the discovered site. The fossil forest is located in Inner Mongolia, in the northern region of the Helanshan Mountains. The area preserved by the volcanic ash is suspected to be a staggering 6.2 miles in length - almost the full length of the coal mine, which is 7.72 square miles in area. Thus far, the scientists have explored only 10,763 square feet of the ashen fossil forest, uncovering a multitude of leaf, tree, and plant fossils, some of which still bearing a greenish hue. An array of ferns have been found in addition to extinct trees with leaves still attached to the stem, and branches leading down to their trunks. The volcanic fossils give an accurate indication of where each plant grew in relation to the others in the forest. Scientists were lead by University of Pennsylvania’s Hermann Pfefferkorn. They will continue to catalog this nearly 300 million year time capsule as they go on.